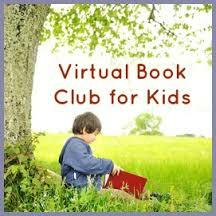 This month for Virtual Book Club for Kids, we are spotlighting books by Karma Wilson. Check out Karma Wilson’s official website to see all her books, teacher resources, book activities, school visits, and kids corner. 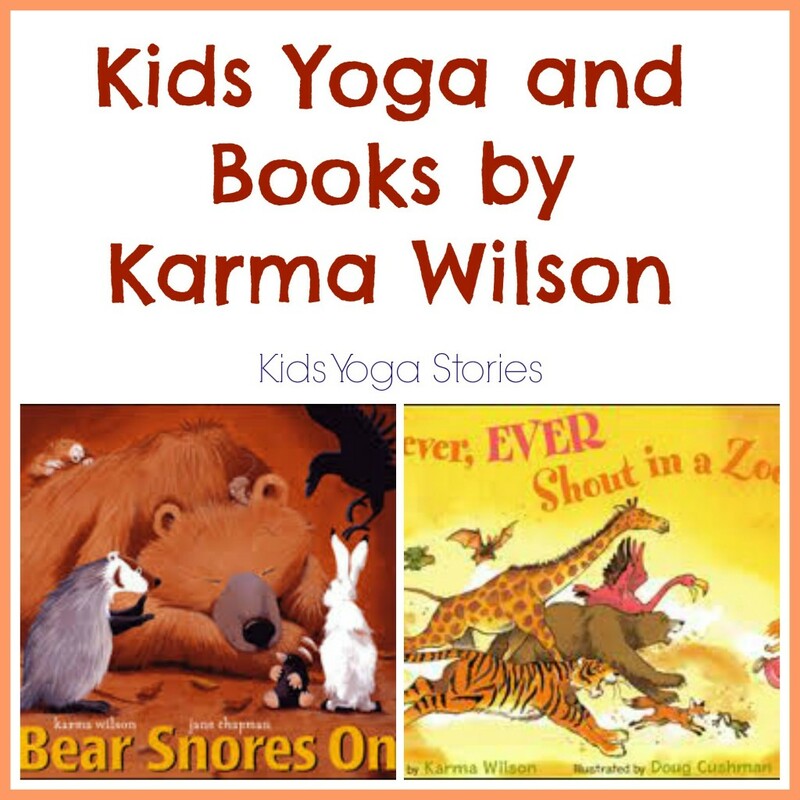 The first Karma Wilson book that we fell in love with was Bear Snores On. Our daughter was an infant at the time. She loved to hear the rhyming text and look at the forest animals. It is a magical book to read aloud. I was then ecstatic to find that Karma Wilson has written a whole series of eight Bear books with the same charming characters and sing-along text. Reading aloud Karma Wilson’s books are a treat. Now, add in movement with your reading and you have a fun, active experience to do with your children. Perfect for an indoor activity during the winter months. 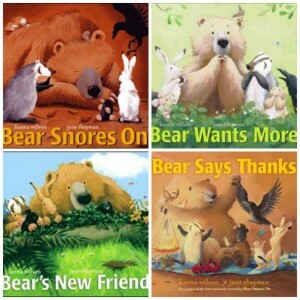 Find six of the animals featured in the bear books, along with the corresponding poses below. Encourage your child’s creativity as they invent their own poses for the animals. The animals are listed in a particular yoga sequence to invite flow from one pose to the next. Do whatever works for you and your child. Focus on having fun with movement, and don’t worry about getting the poses “right”. Enjoy your animal poses! The zoo is not far from where we live in San Francisco. A trip to the zoo is one of our favorite activities to do with our toddler. We love to watch and talk about the various animals. We have also made it a habit of acting out the animals through kids yoga. 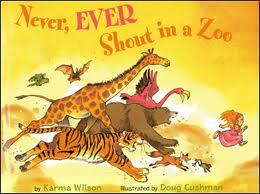 We were so excited to find Karma Wilson’s Never, EVER Shout in a Zoo book at our local book shop. Another great way to integrate our zoo experience with kids yoga and reading books. Again, encourage your children to make up their own poses for the animals that they see at the zoo. The ten animal poses are listed in the order that they appear in the book. Have fun with movement! 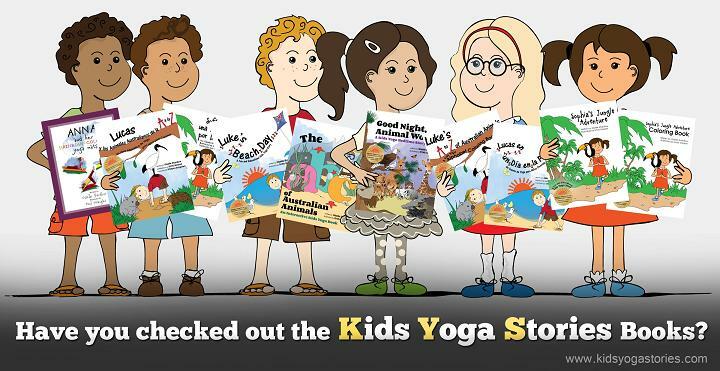 For images and descriptions of the poses, see Kids Yoga Poses. September – Bill Martin Jr.